Subhojeet from Calcutta, BHM Graduate. HANDLING FRONT OFFI.. GUEST HANDLING GUEST HOUSE MANAGEME..
are one of expert skill area's of Subhojeet . 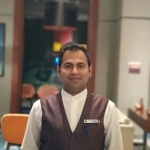 Subhojeet is working in Chefs/Stewards/F&B/Housekeeping/Front Office industry.